Idiot Free Zone - Who pays the tax? The purpose of today's post is to correct a misconception that most people seem to have about taxes. We spend an awful lot of time fighting over who is taxed, when we should be fighting over what is taxed. But whereas Sanders sees this as a big problem and a further sign of the growth of American plutocracy (or as I like to call it, crypto-plutocracy), I'm... actually pretty okay with corporate tax revenue declining. In fact, I wouldn't mind if we simply got rid of the corporate tax entirely and moved it all to the personal income tax and the capital gains tax. To explain why, I need to talk about something called tax incidence. A key insight of economics that most people miss is that the person who writes the check is not the person who actually pays the tax. The person who actually pays the tax is the person who ends up with less money after the tax is implemented. To see why these aren't the same, imagine that there's some product which is currently selling for the absolute cheapest it could possibly be sold. We'll call them... gizmos. Suppose the price for one gizmo is $10. 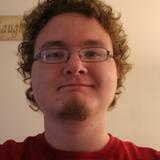 This is an absolute minimum. Any less, and it would cost more to make a gizmo than it is selling for. Now suppose we institute a tax of $2 on gizmos; every time you sell one, you have to pay $2. The seller writes the check. What's going to happen to gizmos? Either they're going to stop being sold entirely, or the price is going to go up to $12. It ultimately depends on whether people are willing to pay $12 for a gizmo. If they are, the seller will end up with the same as before, and buyers will give $2 each to the government. Or, suppose we didn't make the seller pay it. Suppose we instituted the tax on buyers; every time you buy a gizmo, you have to pay $12. What happens now? The price remains at $10, sellers are unaffected, and every buyer will have to give $2 each to the government. Or, if they aren't willing to give up $12 each time they get a gizmo, they'll stop getting gizmos. In other words, the exact same result. It's fairly easy show, in fact, that we could divide up this tax however we want—$1 from the seller and $1 from the buyer, or $1.50 from the seller and $0.50 from the buyer, etc.—and the net effect of the tax will not change. The net effect of a tax simply does not depend on who it is collected from. 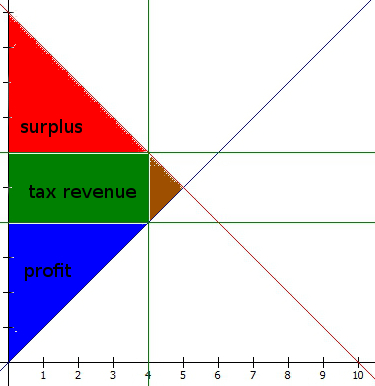 It depends on three things only: The size of the tax (obviously), the demand curve, and the supply curve. This is why it doesn't matter how much of the payroll tax is collected from employer contributions versus employee contributions. If we raise the employer contribution, wages will go down to compensate. If we raise the employee contribution, wages will go up just enough to pay the difference. All that matters is the total amount of the payroll tax and the supply and demand curves for labor. In general, we can draw the supply (blue) and demand (red) curves; the horizontal axis is the number of gizmos sold, the vertical axis is the price of each gizmo. If we have a competitive market, the price will be at the intersection of the two curves so that supply equals demand. 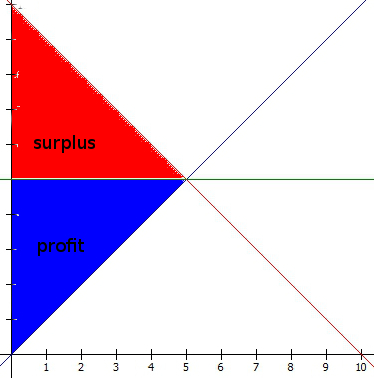 The area below the price line and above the supply curve (blue) is the profit for sellers; the area above the price line and below the demand curve (red) is the “surplus”, a measure of how much benefit people get from buying the product. If you'd be willing to buy a gizmo for $15 and it actually costs $10, you get $5 of surplus for buying it. If we add a tax, we effectively raise the price that buyers pay and lower the price that sellers receive—the difference between the two is the tax. Remember, it doesn't matter who pays the tax; what matters is the total amount of the tax on each gizmo. 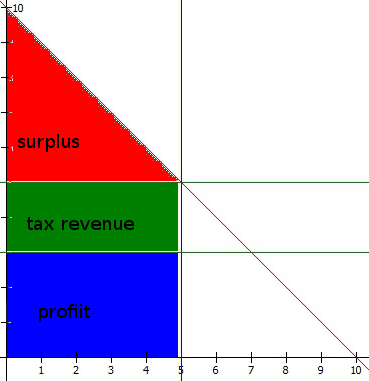 This introduces a new area on the graph, the number sold times the amount of the tax, which is the tax revenue (green). But it also cuts off an area of the graph, an amount of surplus that is simply lost due to inefficiency; we call this deadweight loss (brown). Who actually gets hit by this deadweight loss depends upon how the tax affects the price and quantity sold, which in turn depends on how the supply and demand curve are shaped. If buyers are unwilling to pay more, they will bear less of the tax; we say that demand is more elastic in that case. If they are willing to pay more because they really want the good, we say that demand is inelastic. If sellers are unwilling to sell for less, they will bear less of the tax; supply is elastic. If sellers are willing to sell for less because they can make gizmos very cheaply, they will bear more of the tax; supply is inelastic. In all of the previous I've been assuming that we're using some kind of sales tax (specifically an excise tax), where you pay a fixed amount for each gizmo sold. It's relatively easy to extend this to more traditional sales taxes, where you pay a fixed percentage; and by treating workers or hours of labor as “gizmos” you can apply the same basic reasoning to payroll taxes as well. In all these cases we have a clear idea of what we are taxing—we are taxing gizmos, or we are taxing full-time workers. As a general rule, taxing something makes it more expensive, which makes people buy less of it. In technical terms, taxes disincentivize—if you put a tax on something, you tend to end up with less of that thing. Precisely how much less depends upon the supply and demand curves. Sometimes that's exactly what you want. The reason we should have a carbon tax is that we do actually want to reduce carbon emissions. The reason we have an alcohol tax is that we're trying to reduce alcohol consumption. But sometimes when you think you're taxing one thing, you end up really taxing something else, and thereby creating an incentive you didn't mean to. How does this apply to corporate taxes? Well, that's the problem. It's not as clear what corresponds to the “gizmo” here, just what it is we are disincentivizing. It might be that corporate taxes do fall entirely upon profits, in which case they're fantastic; profit really can't be discincentivized. Corporations exist to make profit; taking their profits away will make them mad at you, but it won't really change their behavior since they were already doing whatever they could to make as much profit as possible. This is why income taxes are a good idea; as long as you have a sensible income tax system where going into a higher bracket never ends up giving you less take-home pay (a lot of people seem to think this can happen in our current system, but actually it cannot, except in a few rare cases involving eligibility for certain social welfare programs like TANF and Medicaid), and as long as you tax all forms of income equally (we do this pretty well for labor income, but we tax capital income significantly less), then there's really no incentive to do anything differently as a result of the income tax. There are a few nuances here that need to be considered involving whether you work at all, how many hours you work, and how you'll respond to risk; but basically most people work full-time at the highest salary they can find in their chosen profession, regardless of what the income tax rate may be. But in fact I don't think corporate taxes work this way in practice. They do seem to provide some incentives, and most of those incentives are bad (they are what we call perverse incentives). The first thing they do is provide an incentive to shift your profits to overseas subsidiaries. Suppose you make $1 billion in profits in the US. You could pay US taxes on it and end up with $650 billion to keep for yourself—or, you could set up a subsidiary in the Cayman Islands, pay that subsidiary $1 billion to do... something (it doesn't matter what), and then report that you made no profits this year because you had to spend all your money on that... very important thing the Cayman Islands subsidiary did for you. Then the Cayman Islands subsidiary reports their own profit of $1 billion, doesn't pay taxes on it because the Cayman Islands doesn't have a corporate income tax, and then sends it all straight back to you, the CEO, so that you now have the full $1 billion to work with instead of only $650 billion. Corporate taxes also provide an incentive to finance investments through debt instead of cash or equity, because debt payments are deductible while cash income and stock dividends are not. This makes corporations more dependent upon banks, and makes credit crises that much worse for our real economy. Corporate taxes provide an incentive to pay your CEO a higher salary, because you can report that as an expense and thereby make it tax-deductible. If instead we simply taxed the CEO's income, it wouldn't matter whether you paid it as a salary or as dividends. For these reasons and more, the real cost of corporate taxes may not be falling upon CEOs and rich shareholders. Some of it may be falling upon the rest of us, as the efforts corporations use to avoid paying taxes result in them doing things that are otherwise harmful to our economy. The truth is, we really don't understand the incidence of corporate taxes all that well—which means that when we fiddle with them, we're never quite sure what will happen. Finally, think about what happens when you tax all profits the same regardless of whom they are going to. While most stock dividends go to the rich (the top 1% owns over half of US stocks, bonds, and mutual funds), a substantial proportion go to the middle class; about half of all Americans own stock directly or indirectly. If you taxed dividends as personal income, we could make that tax progressive, so that people who receive a lot more in dividends pay a higher rate. But when you tax profits at the corporation's end, that dividend tax becomes completely flat; you pay the same rate on your HP dividends whether you own a single share of HP or are Carly Fiorina. I don't agree with the American Enterprise Institute on a whole lot of things, but AEI's reform plan for the corporate tax actually makes a lot of sense to me: Get rid of the corporate tax and replace it with a system whereby capital gains and dividends are taxed as ordinary income. In addition to AEI's plan, I would then raise the rate on ordinary income, and add higher brackets like $1 million, $2 million, and $5 million. And on that part, I'm in agreement with Bernie Sanders.